The Palace of the Ooni of Ife in Nigeria has announced the cancellation of the proposed trip to be enbarked by the Arole Oodua & Ooni of Ife, Ooni Adeyeye Enitan Ogunwusi, Ojaja II to the United States Of America tomorrow. This was contained in a press release signed by the Ooni's Director of Media & Public Affairs, Comrade Moses Olafare and made availlable to journalists on Thursday. 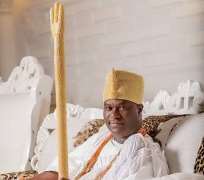 Olafare said the decision of Ooni Ogunwusi to cancel the trip was necessitated by the postponement of the TellAfrica International Art And Craft Festival formerly slated to hold in Baltimore MD, USA. "The 3-day event for which Arole Oodua, Olofin Adimula Ooni Adeyeye Enitan Ogunwusi, Ojaja II is expected to be in the USA from tomorrow has been postponed and this has warranted the cancellation of the proposed trip". "The Art festival will now hold in June 2019 in commemmoration of the Black History Month/Odunde festival in Philadephia and the 400 Years Anniversary of Blacks in America to which His Majesty has also been invited as a Special Guest". "This is to enhance total inclusion owing to the fact that, Kabiyesi intends to ensure all Africans nationwide do not miss the big event which is expected to unite the world as a whole". Olafare said. The Project Director & CEO of TellAfrica, Gbemisola Bisi-Taiwo had earlier in a press statament announced thet event has been rescheduled to hold on 14th, 15th and 16th of June, 2019 at the Convention Centre, Downtown Baltimore, The Palladium Centre, 2900 Liberty Heights Ave. Baltimore, Tropical Grill Lounge, 153-41 Rockaway BLVD, Jamaica, NY. USA.